Move over Millennial landlords (and tenants)…Generation Z has arrived. Did you hear about the teen landlord who turned a foreclosure opportunity into an investment property? How old were you when you bought your first home? 25 years old–30? What about your first investment property? 40 year old? 50 years old? 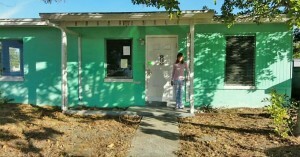 Willow Tufano, a 14 year old Florida teen recently became the youngest teenage landlord in America after purchasing an investment property for just $12,000. significant return on investment, they helped to purchase the short-sale property (she had $6,000 saved by herself) and fix it up. She now rents the property for $700 mo. After paying her parents back, which should take around a year, Willow will net $8,400 annually from her rental property–over $33,000 by the time she graduates high school and heads off to college. TV host Ellen DeGeneres , invited Willow to her show to discuss this rare activity for a teenager. Watch to see how she did it and what her future plans are. What were your future plans when you were 14 years old? Were you thinking of owning real estate or a rental property property back then?